The Community Involvement committee organizes and participates in numerous volunteer projects throughout the semester. 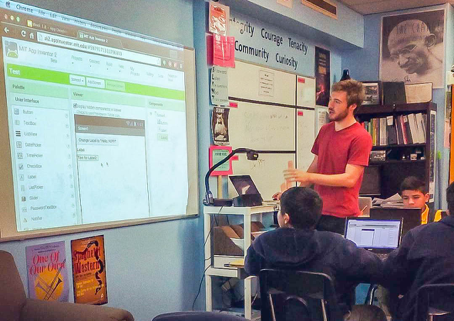 Our weekly volunteer programs are Young Scientists and Kids Who Code, which both work to support the STEM education of the underprivileged youth of Austin. Additionally, we are involved on the UT campus through school sponsored events like Explore UT, Longhorn Halloween, Longhorn School Bus, and Natural Sciences Week. Aside from our assigned responsibilities, each member of this committee takes it upon themselves to organize engaging and beneficial service events such as gardening at the UT Concho Community Garden and volunteering at the Allies Against Slavery Summit. By being on this committee, members automatically sign up to be teachers, role models, and leaders at UT and in the Austin community. This is on a first come, first served basis, so please sign up ahead of time! You can sign up for these programs here. Please indicate which UT organization you are affiliated with when you sign up. Young Scientists is an educational outreach program whose purpose is to expose students in underserved schools to the fascinating world of science. This year, we are working with 6th graders at KIPP Austin Collegiate Preparatory and 5th graders at Joslin Elementary School, where we involve students in hands-on experiments and introduce them to new scientific topics. Kids Who Code is a weekly outreach program that partners with a fifth grade class at Joslin Elementary School. In this program, we facilitate interactive group activities to teach the basic computer science concepts. Thanks to a grant from Texas Parents, we are able to use Lego Mindstorm robots and synthesizers to provide hands-on coding experience for the students. We engaged a classroom of over 30 elementary students for three whole hours! Planning was a large task, but the CI committee’s organization and execution led to a fun and exploratory experience for everyone: learning about chemical reactions with magic snow, engineering wingless gliders, and blasting off bottle rockets were just some of the exciting activities!